Need more information about booking Home 7322077 ? Excellent Rates and such a lovely, luxury Villa for an extended family, large group of friends or golfers. Beautiful luxury holiday home available to be rented as an exclusive Villa to a large family or group of friends. 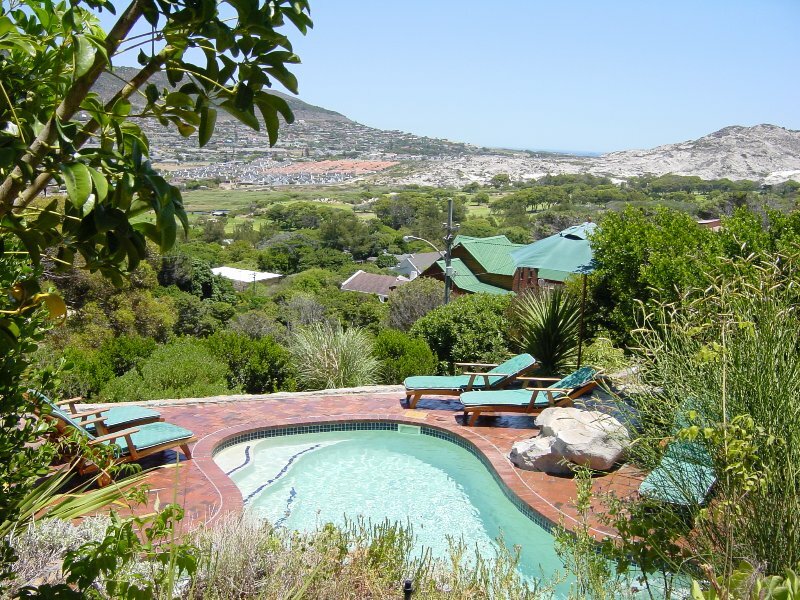 Situated on the mountain in Clovelly, Fish Hoek, CAPE TOWN with lovely views, pool and jacuzzi. A lovely safe area and central to all the main tourist attractions. It really is a lovely house and area. Large open plan family room/dining area and kitchen, large balcony for outdoor entertainment. Separate TV lounge, breakfast room and bar. 8 ensuite bedrooms plus extra sunroom which sleeps 2. Serviced daily except public holidays and Sundays. Fantastic for hiking, golf and beautiful beach or just to stay and relax around the pool in the wind free area. Excellent golf courses close by: Clovelly, Westlake and Steenberg. POOL SUITE: consists of a lovely big bedroom with twin beds (which can be made up to a king-size bed on request) and an en-suite bathroom with shower a separate private lounge/dining area with a kitchenette. The lounge has sliding doors out onto a lovely balcony with outdoor furniture and a view over the pool and towards the golf club. This suite has a large bedroom which makes it is possible to add in another single bed if requested. A big family room which is open-plan to the dining room and kitchen. This room has sliding doors onto the main front balcony that has a stunning view over the golf course, the Fish Hoek valley and distant Atlantic ocean. The family room also has a sliding door leading into a lovely "honest" pub/bar which also has a fridge and has sliding doors onto the back patio, which faces the mountain. The kitchen is fully fitted with a large fridge/freezer, stove, microwave and dishwasher. A separate lounge with a Jetmaster fireplace, VCR and DVD player. This Lounge has a sliding door opening onto the main wooden deck on the one side and on the other side there is a small breakfast room leading from it. 1 luxurious bedroom with a queen size bed and en-suite bathroom with a double shower and spa-bath. This bedroom has a beautiful bay window in the front and also has sliding doors opening onto the main balcony. Lounge/dining room and kitchenette combined with sliding doors onto deck facing the mountain with outdoor furniture and barbeque facility and lovely views of the mountain. Two en-suite bedrooms, one on either side of the lounge. The main bedroom has a king size bed and lovely en-suite bathroom with shower and bath. The other bedroom has twin beds with an en-suite bathroom (shower only). Both bedrooms have windows facing the mountain. A double garage with automatic doors. Off street parking is provided for 4 vehicles. You can get in touch with Sylvia (the owner) through the contact form on this page. Send Sylvia (the owner) an email through the contact form on this page. Alternatively, if there’s a phone number on this page, you can call them. How do I contact Sylvia (the owner)? If you’ve already booked, go to Manage your holiday booking to view Sylvia the owner's contact details or send them a message. Or send Sylvia (the owner) an enquiry through the Contact the owner/manager form if you’d like a quote or more info first. When you pay online through the Book your stay form, a booking request is sent to Sylvia (the owner). You’ll find out within 24 hours whether they’ve accepted - no money will leave your account before then. You can also request a quote from Sylvia (the owner) through the contact form. The owner will email you the total cost for your dates and a link to book and pay online. Use the Book your stay form to pay provisionally online. You can pay by credit/debit card or PayPal. Sylvia (the owner) will have 24 hours to accept the booking and no money will leave your account before then. Why can't I call Sylvia (the owner) before booking? You’ll need to contact Sylvia (the owner) to do this. Send them a message in Manage your holiday booking or through the contact form on this page. You can request to change the dates or number of people on your booking via the Manage your holiday booking page. To change your holiday dates use the Edit booking button. If you need to change the number of guests staying then send Sylvia (the owner) a message. If Sylvia (the owner) agrees, they’ll send you a revised quote outlining the changes. You can review and accept/decline this from the Manage your holiday booking page. You’ll have 48 hours to take action before the revised quote expires.